Let us discuss lettuce, is it all the same? Lettuce is something I eat daily since my angioplasty in 2012. A salad is my normal lunch when working at home, or eating away from home. 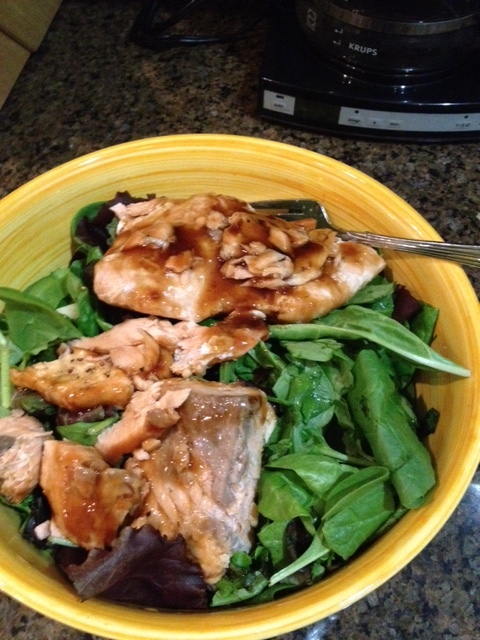 My wonderful salmon salad, made with leftover salmon. A salad is my lunch daily these days. I generally buy a spring mix of various lettuce types at Costco or elsewhere if I see the one–pound box on sale. I also buy baby romaine hearts at Costco which can be used in place fo taco shells for some reformulated Mexican meals. Is all lettuce the same? Not exactly, says fitness expert Jillian Michaels, the former Biggest Loser trainer. The greener the leaves, the healthier, she says. Iceberg lettuce gets a bad rap from her, and a lot other nutrition experts. It was the only kind of lettuce I ate as a kid, I miss it these days. Jillian suggests mixing the lettuce types you have for some variety. It’s all green stuff to me.